It was chunky, warm, and easy. In a medium soup pot, boil vegetable broth, potatoes, salt and pepper until potatoes are tender. With a food processor or blender, blend about half of the soup until nice and smooth. Return back to pot with remaining potatoes and broth. 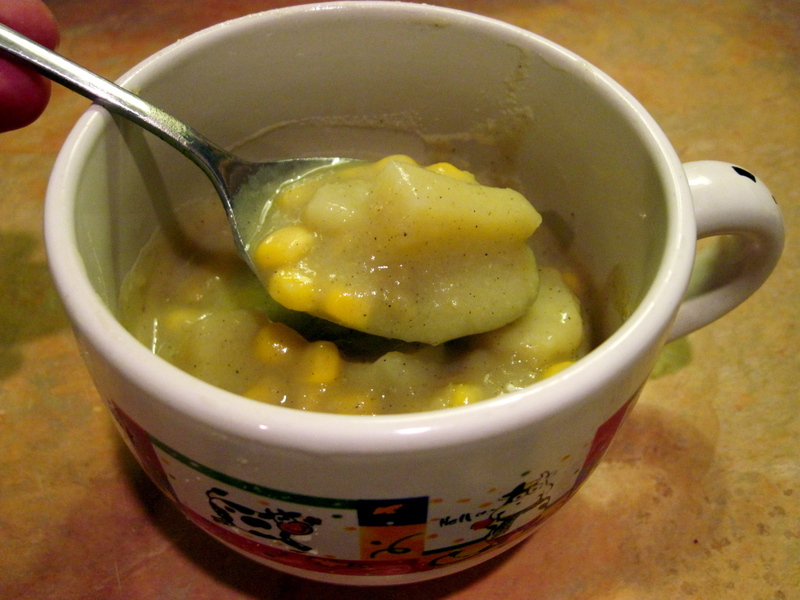 Stir in soymilk and corn. Simmer for about another 5 minutes or so and then let sit for several minutes before serving. You can use less potatoes if you’d like a more “soupy” soup but I like the thick chowder this recipe produces. That’s it. Super easy and super yummy. I made this the other night, and added some curry powder to the recipe… delish! Thanks for your wonderful blog! So many great recipes here! !